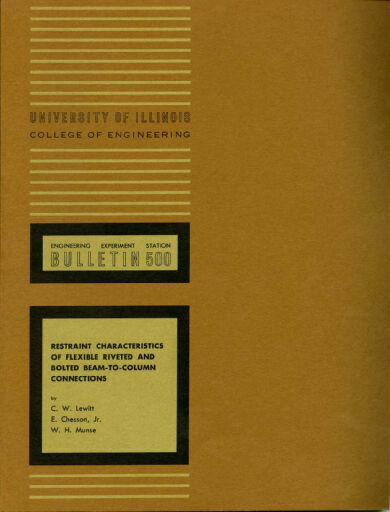 Digital Surrogates from the Engineering Experiment Station Bulletin Records contain a digitized copy of the Engineering Experiment Bulletin number 500, relating to the research "Restraint Characteristics of Flexible Riveted and Bolted Beam-to-Column Connections" by C. W. Lewitt, E. Chesson Jr. and W. H. Munse. For more information about the Engineering Experiment Station Bulletin or the University Experiment Station, please see this Record Series catalog record in Archon. The Engineering Experiment Station Bulletin Records (Digital Surrogates), 1969 are managed by the University of Illinois Archives and do not feature precise descriptive information for each item. Discover their contents by browsing the folders and files. For more information, contact an archivist at illiarch@illinois.edu.